Doug with Dr. Humberto Gonzalez Mercado. San Luis Potosi’s med school where he trained is hailed as among the best in Mexico. Like crocus buds pushing their way through the snow, faith that felt authentic and sure reappeared yesterday morning. Just the heads pointing to the sky but it was enough. The constant hip pain that was the new symptom of my month long illness would too pass away and I would soon be active and healthy again. Lacking a definite diagnosis, faith didn’t come into play in the early days of my illness. Cancer had been mentioned but soon the evidence weighed against such a diagnosis. So in the absence of a focus on faith, while going over my favorite Psalms, my favorite prayers, and praying for myself and others, gratitude quickly emerged as the primary theme of my thoughts. Gratitude for the concern and prayers of family and friends in many places. 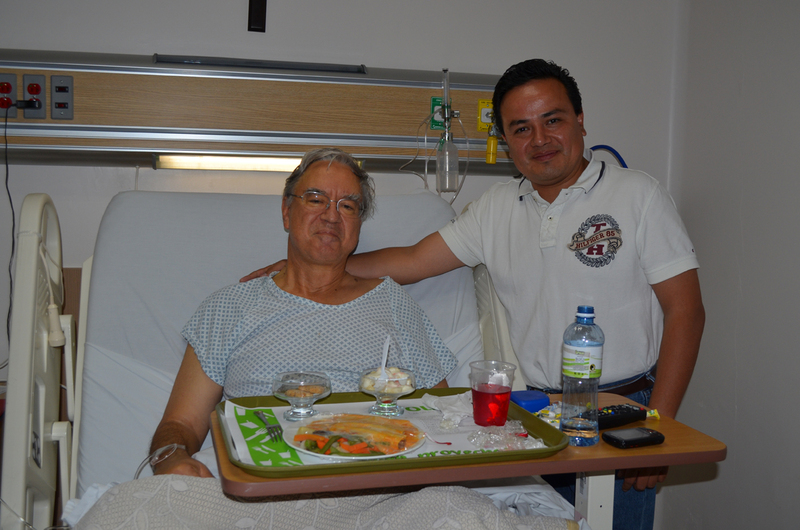 Gratitude for the many hospital visits of friends in Mexico coming from as far as two hours away. Gratitude for the dedication to caring for others manifested by nurses and doctors in both Oli-Med Hospital San Luis Potosi and at the University of Kansas hospital in Kansas City where I was transferred October 8. 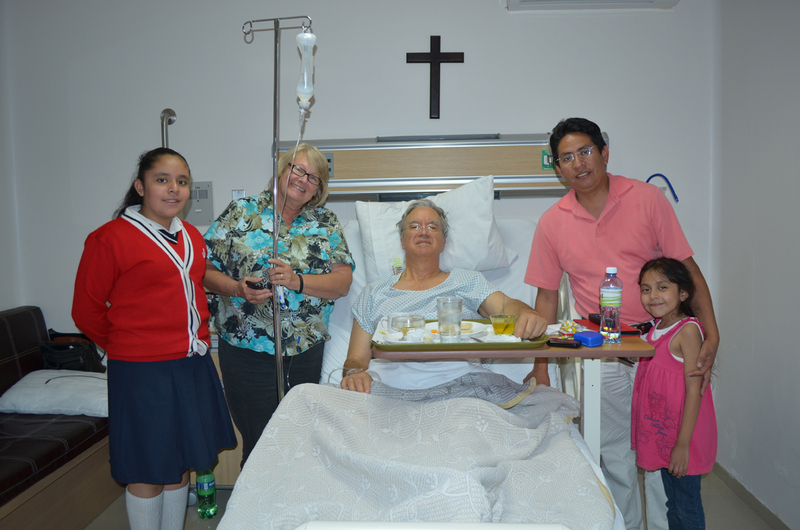 Gratitude for the quality of care I have received began with the initial visit of Dr. Humberto Gonzalez Mercado of San Luis Potosi Julien Carrillo Disciples Church. It was soon apparent that he was both competent and ready to commit to seeing me through this illness at no cost. He it was who on October 1 had me admitted to the private room in the SLP Hospital whose nurses and staff treated me like royalty. Dr. Mercado is the only doctor I have ever known who asked me to pray for another patient of his; I was grateful to be under the care of such a physician whose directness, sharing of his own life and optimism I could feel contributing mightily to my healing. Thanks to the MRI and other expensive tests (covered by my U.S. care-only health insurance) in Kansas City we now know the extensive blood clot on my liver is the cause of the symptoms I had felt to a slight degree even five months ago. So my blood is being thinned under medication and once I adjust to the effect of coumedin on my body we will be flying back to SLP. My room in the Kansas City hospital faced the sun rise and I was treated to a golden horizon most mornings before facing the needles of the new day. W.H. Auden’s definition of faith is “to choose to do what is difficult every day of our lives as though it were easy, that is faith”. Some times the difficult may just be getting out of bed. So I’m also very grateful for those sun rises in the hospital that made it so much easier to get out of the bed. Dr. Mercado’s Pastor Rogelio Espino Flores with daughters and Kate. Total cost of my six night stay in Oli Med Hospital came to less than $4000.